RALLY FOR SB 3095 SD1 HD1 ON APRIL 9TH! Hawaiʻi State Capitol Rotunda 12-2pm. Grassroots lobbying from 2-3pm. The current draft of this bill includes: 1) mandatory disclosure 2) no spray zones around schools and 3) a ban on the use of the neurotoxin chlorpyrifos. Hawaiʻi could make history by being the first state to ban chlorpyrifos for outdoor use. Chlorpyrifos is known to cause permanent neurological damage to fetuses and childrenʻs developing brains, even at very low levels. The EPA was poised to ban chlorpyrifos for outdoor use prior to the Trump administration. It was banned for indoor use in 2001. 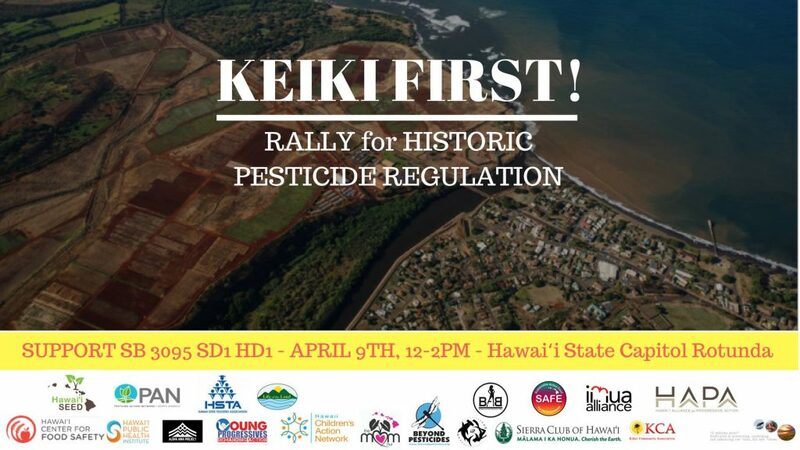 Join us on April 9th to let our legislator’s know that our communities need greater protection from dangerous pesticides and the basic right to know what we are exposed to.